June couldn’t decide if it wanted to be wet or dry, cold or hot, so it was all of it! Precipitation ranged from 25% of normal to more than 200% of normal during June. June precipitation was variable, ranging from 25% of normal in central Maryland and Downeast Maine to more than 200% of normal in northern New York and northern Vermont. 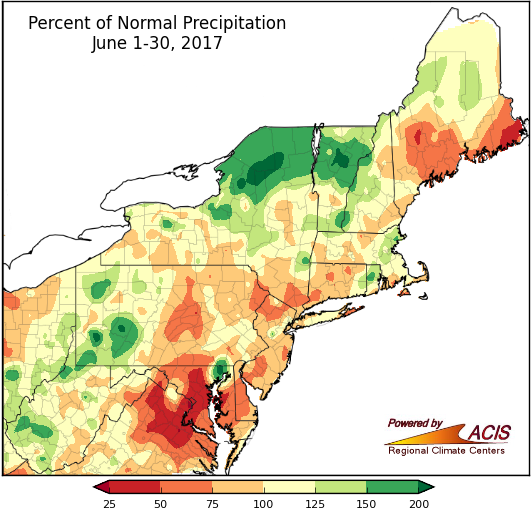 Below-normal precipitation contributed to abnormal dryness being introduced in central Maryland, southern Pennsylvania, and coastal Maine during the month. 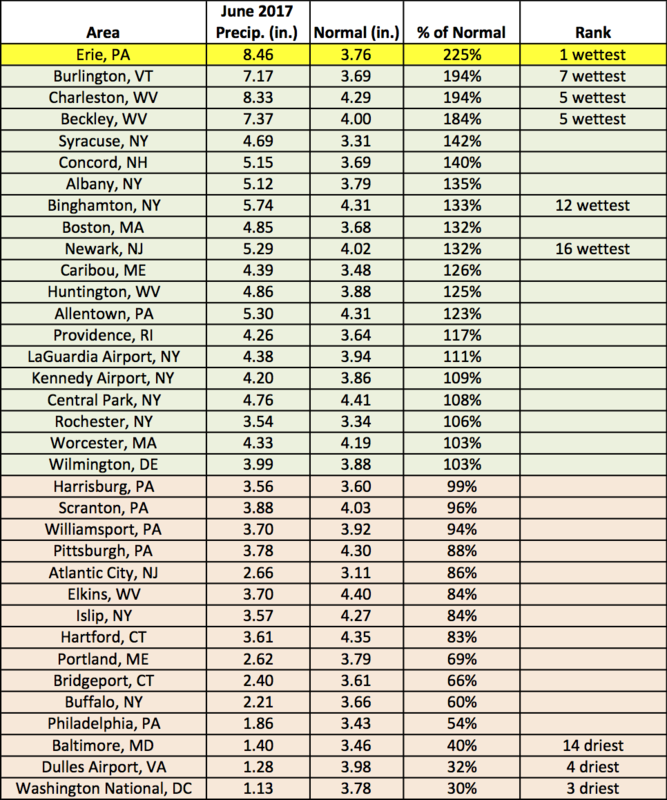 On the other hand, Erie, PA, had its wettest June on record with 225% of normal rainfall. At the 35 major climate sites, twenty sites were wetter-than-normal, with six of those ranking this June among their top 20 wettest. Of the 15 drier-than-normal sites, three ranked this June among their top 20 driest. 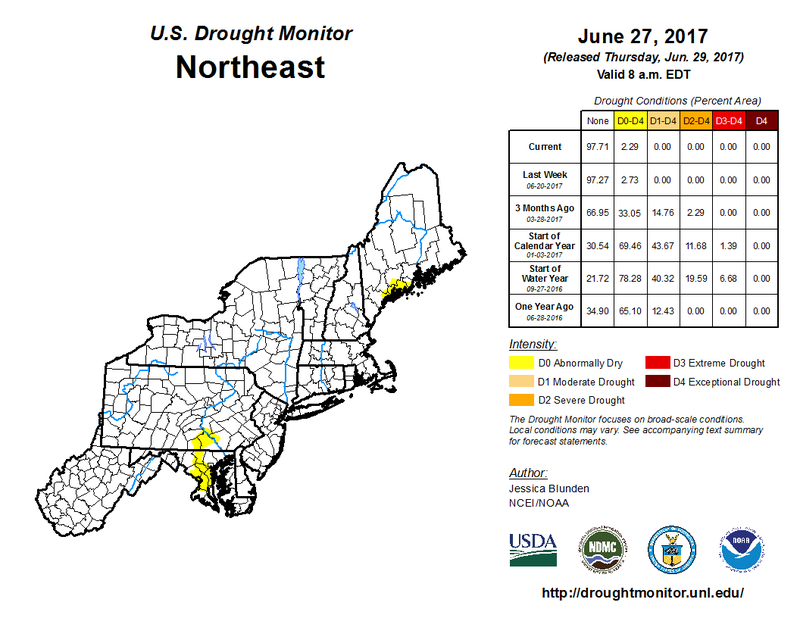 The U.S. Drought Monitor released on June 29 shows some areas of abnormal dryness in the Northeast. Click to enlarge. June precipitation at the major climate sites ranged from 30% of normal at Washington National, DC, to 225% of normal in Erie, PA, their wettest on record. Thirteen EF-0 or EF-1 tornadoes (four in Pennsylvania, three in West Virginia, two in New Jersey, two in New York, and one each on Delaware and Maryland) and straight-line winds of up to 100 mph caused damage in the region during the month. 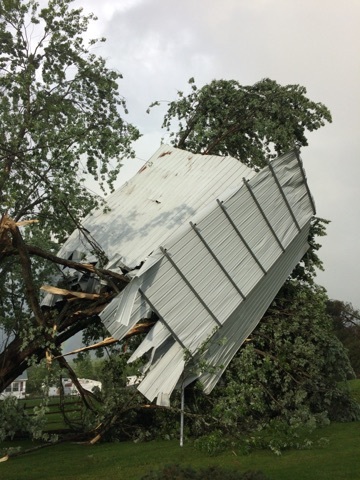 According to the Pittsburgh National Weather Service office, one of those tornadoes touched down in Clarion County, PA, making it the county’s fifth tornado this year; however, between 1950 and 2016 the county only had eight tornadoes. Heavy rain produced flash flooding in the region, leading to numerous road closures and washouts, as well as several mudslides and water rescues. Damage from an EF-1 tornado in Fulton County, NY, on June 30. Image courtesy Albany National Weather Service office. Average temperatures generally ranged from 2°F below normal to 2°F above normal during June. June featured a few cool downs and warm ups. At six major climate sites, high temperatures on June 6 ranged from 49°F to 60°F, which ranked among the top five coldest high temperatures on record for summer. On June 13, LaGuardia Airport, NY, tied its all-time warmest June day on record when it reached 101°F. Caribou, ME, had a low temperature of 69°F on June 19, which tied its all-time warmest June low temperature on record. 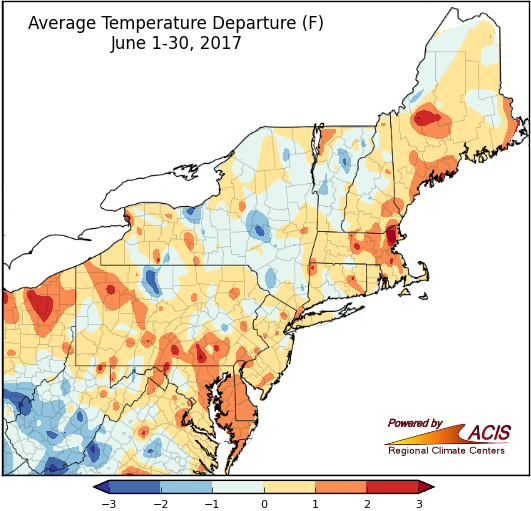 In the end, temperatures averaged out to be from 2°F below normal to 2°F above normal for most of the region for June. Twenty-nine of the region’s 35 major climate sites were warmer than normal, with eight sites ranking this June among their top 20 warmest. 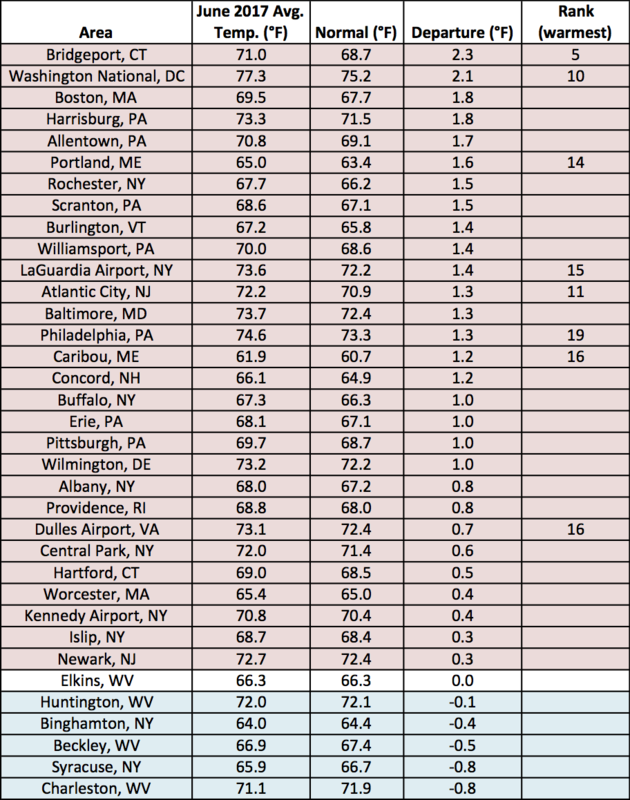 June temperatures at the major climate sites ranged from 0.8°F below normal in Charleston, WV, and Syracuse, NY to 2.3°F above normal in Bridgeport, CT.